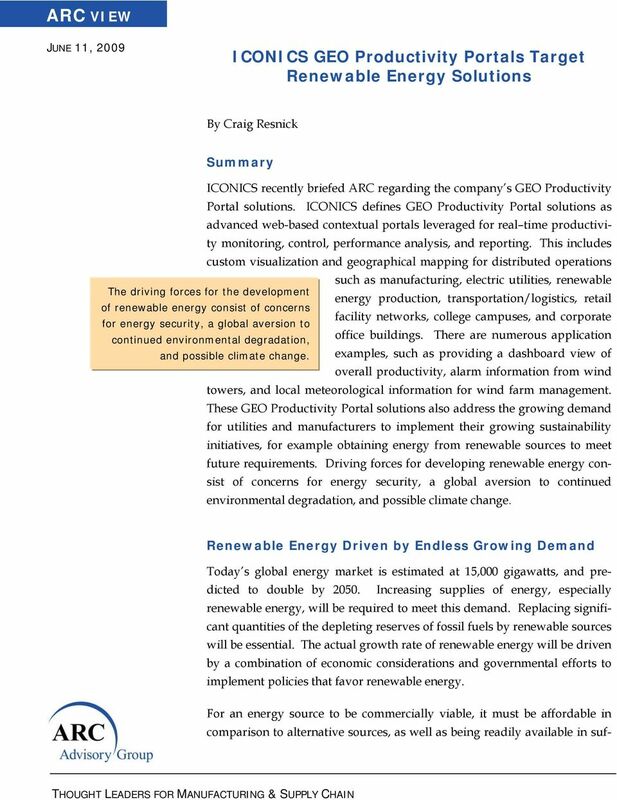 Download "ICONICS GEO Productivity Portals Target Renewable Energy Solutions"
4 ARC View, Page 4 technology approaches. 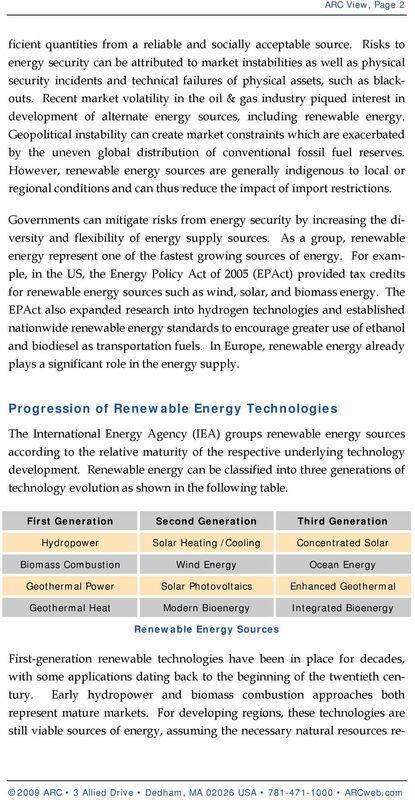 Examples of newer forms of renewable energy include enhanced geothermal and bioenergy systems, concentrated solar power technology, and a collection of technologies associated with ocean energy. The newer solar power thermodynamic approaches can utilize various designs of parabolic collector systems to concentrate the power and route it to a central solar receiver tower. Solar approaches have had an intermittent development history until recently and overall lag wind energy adoption applications. Ocean-based renewable energy technologies consists of energy generation from tidal, thermocline, current, or wave motion sources. Ocean energy is even earlier in the adoption curve than thermal solar, and will require considerable R&D effort to finalize a commercial scale plant system that is both sustainable and economically competitive. ICONICS Renewable Energy Solutions To address the demands created by the need for renewable energy, ICON- ICS has recently released its GEO Productivity Portals. Built on Microsoft.NET technology and designed for Windows Server 2008 and Windows 7, the GEO Productivity Portal solution targets complete operations of wind and solar farms. It provides energy analytics, data historians and reports designed for specific applications (such as wind farm management; offers GEO SCADA, with updates for integrating metrological information; features alarm management with instant alerts; and provides standards-based OPC Connectivity. The GEO SCADA and other portals are built The GEO Productivity Portal solution targets, from a combination of ICONICS technologies, including productivity analysis and for example, complete operations of wind and solar farms; provides energy analytics, data real-time online collaboration and visualization dashboards. 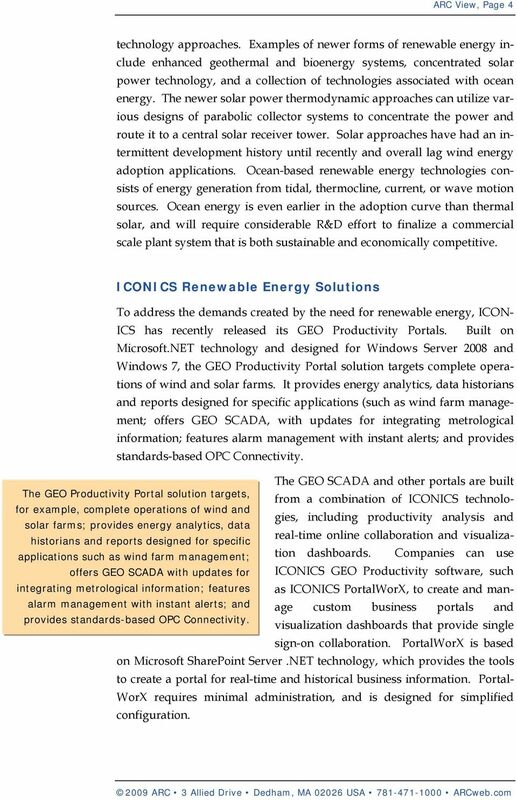 Companies can use historians and reports designed for specific applications such as wind farm management; offers GEO SCADA with updates for ICONICS GEO Productivity software, such integrating metrological information; features as ICONICS PortalWorX, to create and manage custom business portals and alarm management with instant alerts; and provides standards-based OPC Connectivity. visualization dashboards that provide single sign-on collaboration. PortalWorX is based on Microsoft SharePoint Server.NET technology, which provides the tools to create a portal for real-time and historical business information. Portal- WorX requires minimal administration, and is designed for simplified configuration. 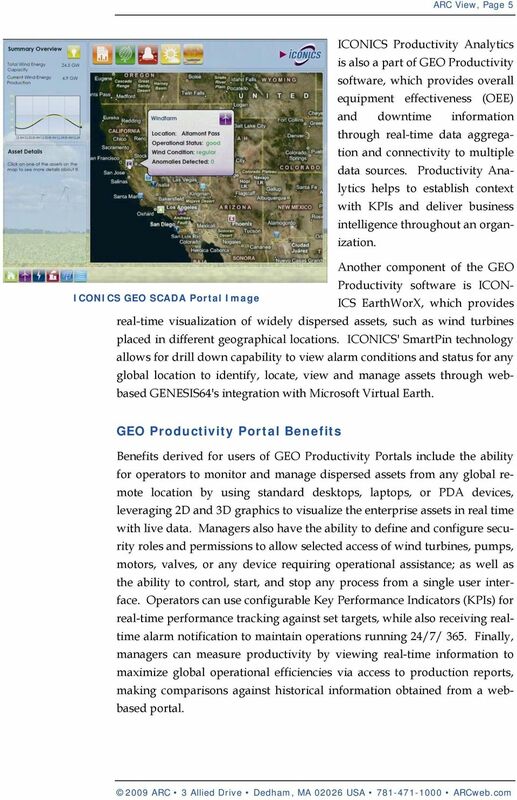 5 ARC View, Page 5 ICONICS Productivity Analytics is also a part of GEO Productivity software, which provides overall equipment effectiveness (OEE) and downtime information through real-time data aggregation and connectivity to multiple data sources. Productivity Analytics helps to establish context with KPIs and deliver business intelligence throughout an organization. Another component of the GEO Productivity software is ICON- ICONICS GEO SCADA Portal Image ICS EarthWorX, which provides real-time visualization of widely dispersed assets, such as wind turbines placed in different geographical locations. ICONICS' SmartPin technology allows for drill down capability to view alarm conditions and status for any global location to identify, locate, view and manage assets through webbased GENESIS64's integration with Microsoft Virtual Earth. GEO Productivity Portal Benefits Benefits derived for users of GEO Productivity Portals include the ability for operators to monitor and manage dispersed assets from any global remote location by using standard desktops, laptops, or PDA devices, leveraging 2D and 3D graphics to visualize the enterprise assets in real time with live data. Managers also have the ability to define and configure security roles and permissions to allow selected access of wind turbines, pumps, motors, valves, or any device requiring operational assistance; as well as the ability to control, start, and stop any process from a single user interface. Operators can use configurable Key Performance Indicators (KPIs) for real-time performance tracking against set targets, while also receiving realtime alarm notification to maintain operations running 24/7/ 365. Finally, managers can measure productivity by viewing real-time information to maximize global operational efficiencies via access to production reports, making comparisons against historical information obtained from a webbased portal. 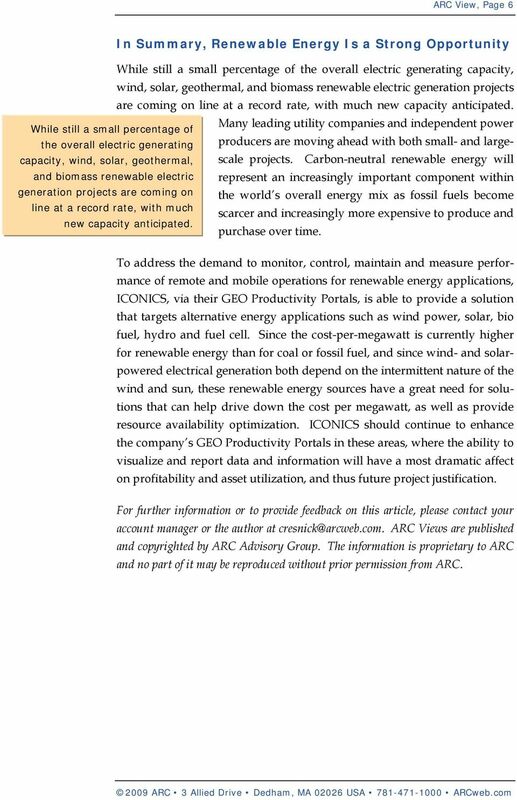 6 ARC View, Page 6 In Summary, Renewable Energy Is a Strong Opportunity While still a small percentage of the overall electric generating capacity, wind, solar, geothermal, and biomass renewable electric generation projects are coming on line at a record rate, with much new capacity anticipated. Many leading utility companies and independent power While still a small percentage of the overall electric generating producers are moving ahead with both small- and largescale projects. Carbon-neutral renewable energy will capacity, wind, solar, geothermal, and biomass renewable electric represent an increasingly important component within generation projects are coming on the world s overall energy mix as fossil fuels become line at a record rate, with much scarcer and increasingly more expensive to produce and new capacity anticipated. purchase over time. 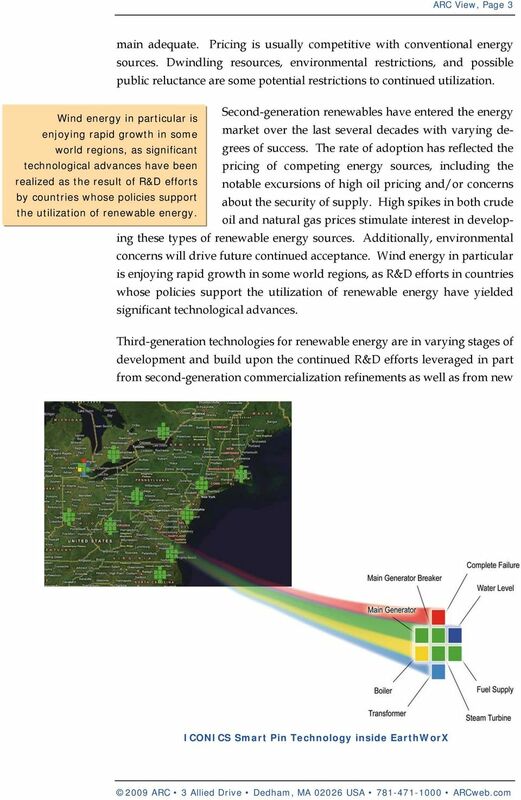 To address the demand to monitor, control, maintain and measure performance of remote and mobile operations for renewable energy applications, ICONICS, via their GEO Productivity Portals, is able to provide a solution that targets alternative energy applications such as wind power, solar, bio fuel, hydro and fuel cell. Since the cost-per-megawatt is currently higher for renewable energy than for coal or fossil fuel, and since wind- and solarpowered electrical generation both depend on the intermittent nature of the wind and sun, these renewable energy sources have a great need for solutions that can help drive down the cost per megawatt, as well as provide resource availability optimization. ICONICS should continue to enhance the company s GEO Productivity Portals in these areas, where the ability to visualize and report data and information will have a most dramatic affect on profitability and asset utilization, and thus future project justification. For further information or to provide feedback on this article, please contact your account manager or the author at ARC Views are published and copyrighted by ARC Advisory Group. The information is proprietary to ARC and no part of it may be reproduced without prior permission from ARC. 1. Nuclear - In YOUR OWN WORDS (not your partner s words) explain how this energy source works. ARC VIEW. Services Oriented Drives Support Critical Energy Management and Asset Management Applications through IT/OT Convergence. Keywords. NED University of Engineering and Technology MECHANICAL DESIGN. Master of Engineering in. Mechanical Engineering Department. Courses Offered. MECHANICAL DESIGN 1. Masters program in Mechanical Engineering with specialization in DESIGN field empowers the student with the required skill set for the job market as well as for further studies. 2. Arktis en kilde til fornybar energi? How to Monitor Large & Live Data Centers. PI makes data centers Green!